The world's fascination with and the continued popularity of 1950's wedding dresses is owed in great part to fifties costumer Helen Rose. The incredible talent she shown in her phenomenal bridal gown designs fashioned for Elizabeth Taylor's role in the 1950 film "Father of the Bride" and for Grace Kelly's fairy tale nuptials to Prince Rainier heralded the beginning of wedding fabulous. Elizabeth Taylor's Wedding Gown in "Father of the Bride"
As with fifties fashion in general, 1950's brides-to-be celebrated a return to the styles, and glamour they had been craving since fabric rationing and war time austerity curtailed lavish weddings. With the more readily available synthetic textiles, the bridal gown industry erupted in clouds of elegant taffeta, organza, and brocade. Imports of Alencon and Battenburg laces completed the wedding dress fantasies. 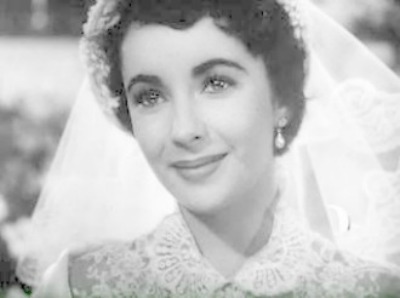 Elizabeth Taylor's portrayal of a beautiful bride in the successful 1950 film, "Father of the Bride," sparked a wedding inspiration frenzy to become one of the most extensively copied wedding dresses since Mainbocher designed the gown for Wallis Simpson's 1937 marriage to the Duke of Windsor. 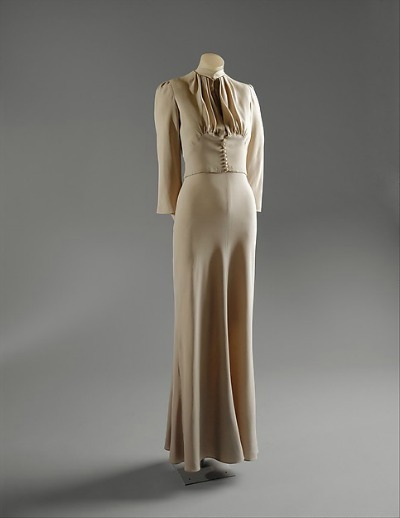 The romantic elegance of Grace Kelly's two wedding ceremony ensembles was accomplished by Helen Rose's extensive usage of the fine laces which had once again become available after curtailment of its European production during the former wartime decade. Kelly's April 18, 1956 civil ceremony outfit was a demure, two-piece suit made of dusky rose taffeta with a beige Alencon lace overlay. 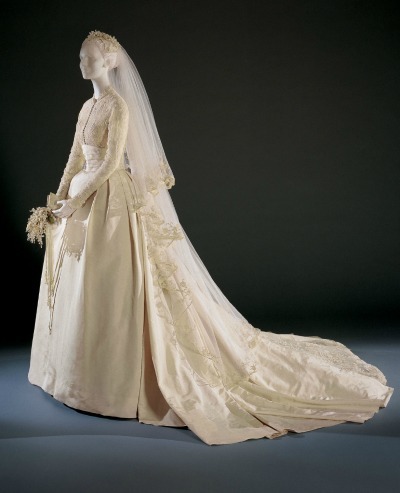 Prince Rainier and Princess Grace celebrated an elaborate religious ceremony on April 19, 1956 where she wore a wedding gown described by the Philadelphia Museum of Art as simple but exquisitely detailed. It was reportedly constructed of twenty five yards of silk faille taffeta and an equal amount of peau de soie. The vintage rose point lace bodice featured an attached under bodice and the heavily pleated silk faille skirt included a smoothing petticoat, a ruffled petticoat, and a foundation petticoat. The lace and silk tulle veil was encrusted with pearls. The Princess of Monaco gifted the incomparable gown to the Philadelphia Museum of Art. While eighteen year old Elizabeth Taylor was elegantly dressed in a traditional satin bridal gown for her May 6, 1950 nuptials to Nicholas Conrad Hilton, Jr., she looked charming in her casual tea-length three-quarter sleeved dress for her February 21st, 1952 wedding to Michael Wilding. As her later style choices have indicated, Jacqueline Bouvier Kennedy would have preferred her wedding dress have a simpler cut to accentuate her slender figure. Instead, African-American couturier Anne Lowe designed Jackie's spectacular wedding dress of 50 yards of ivory silk taffeta with intricate tucks and flowers interwoven throughout the ballgown style skirt. 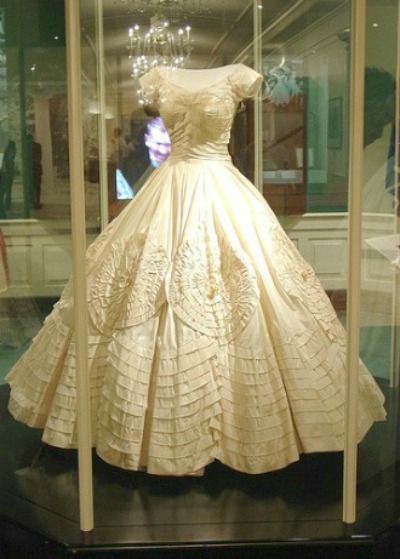 It is still considered one of the most iconic of all 1950s wedding dresses. For her San Francisco elopement with Joe DiMaggio on January 14, 1954, Marilyn Monroe chose a classic black jacket and skirt ensemble with three-quarter sleeves, fur collar, and white gloves. She carried white orchids. Many 1950's celebrities opted for the simplicity of Justice of the Peace nuptials, yet most brides continued to envision cinematic versions. The most famous fashion designers of that era succeeded in fulfilling these dreams with prodigious amounts of nylon tulle, silk chiffon, Duchess satin, and Chantilly lace. 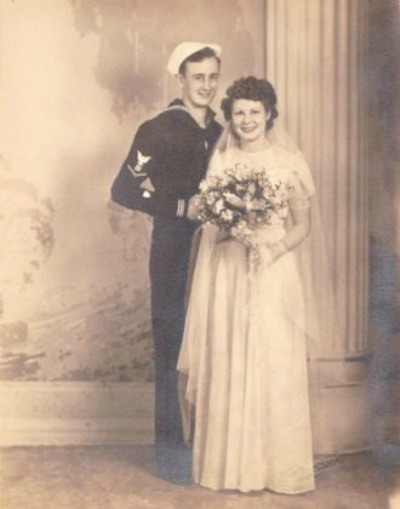 Although portrait and sweetheart style necklines were frequent choices, strapless gowns with tightly fitted bodices gained popularity to become a wedding gown style favorite today. The time-honored ankle or floor length ballgown skirt was customary but wedding dresses soon began to assume the 1950's cocktail dress vogue with its tea-length design. 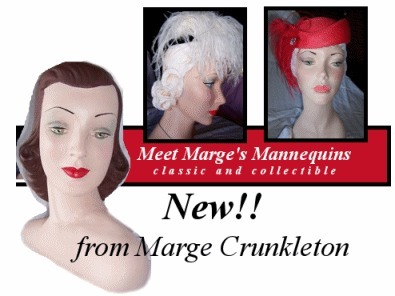 Following the fifties millinery regard, 1950's wedding dresses were not complete without an equally exquisite headpiece. Intricately beaded or sequined hats with birdcage veils were especially stylish wedding attire while ballet or chapel length veils lent more romance to the gown. Wearing gloves was customary then and 1950's wedding dresses were certainly no exception. Usually made of lace or satin, wrist length bridal gloves were worn with long sleeved dresses while the elbow or opera length evening gloves were typically chosen for the sleeveless or strapless gowns. 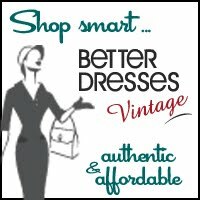 These fifties fabulous bridal gowns illustrate why today's brides-to-be are enamored with the glamour, elegance, and sophistication of vintage 1950's wedding dresses. The photograph captioned above was found in our deceased grandmother's picture box. They may have been from Missouri or Oklahoma.